CHARLES BENJAMIN HEMMER, born November 29, 1926 in Holland, Indiana to Herbert and Anna Hemmer. Graduated from Dale, Indiana High School in 1945 and served two years in the U.S. Army. Spent a year in Occupation Forces in Japan, was recalled to service in 1950 and spent 16 months in Percy Jones Army Hospital in Battle Creek, Michigan. For the last 25 years, he has lived between Nashville, Goodlettsville and Phoenix, AZ. Charles married Mary Jean Foertsch on June 26, 1949. They have two children, Philip Hemmer (Jenny Hemmer) and Christina Hemmer Bell., 4 grandchildren, Chastity Hemmer Mitchell (Bo Mitchell), Caleb Hemmer (Lori Hemmer), Sophie Bell, and Ramsey Bell. Three great grandchildren, Parker and Brady Mitchell, and Evan Hemmer. He worked for General Electric for 17 years, and then started Sharpcut Inc., a tooling company, in Nashville, from 1967 to 1992. Attended Evansville College for two years and taught night classes in tool and die apprentice for eight years. He also taught machine tool classes at Gateway Community College in Phoenix, AZ for two years. Charles had a second career renovating and restoring old homes, both in Nashville and Phoenix. 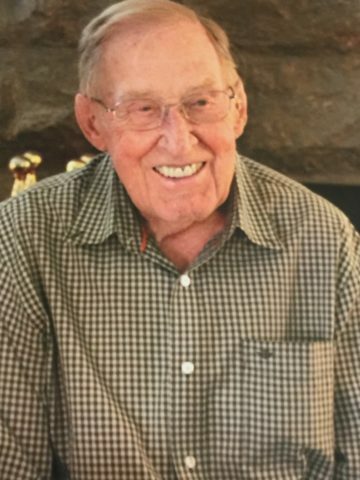 He was an avid golfer and enjoyed woodworking, metal crafting and creating stained glass art. Survived by wife, Mary Jean Hemmer; children, Philip and Christina; grandchildren and great-grandchildren. Brother, Alfred Hemmer of Santa Clause, IN and many Nieces and Nephews. I’m so glad we were able to visit with him a few years ago at Martha and Al’s anniversary. Jean, we are sorry to learn of Charlie’s passing. We have many fond memories of your friendship with Mom and Dad. Jean, I am so sorry about your loss. I will be thinking about you. Jean, I’m so sorry to hear about Charlie. You two made a lovely couple. I could tell Charlie loved and cherished you as his bride, all these years. I sense you will feel a large loss, but rest assured the rest of us will do our best to keep you feeling cherished. Your vows of “till death do us part” will be celebrated and are complete. Live, love, laugh and by all means paint, create something wonderful for the world to behold. You are loved. Phil, I am sorry for the loss of your Dad. The Bible reminds us that God sees our pain and sadness and has promised that soon, “death will be swallowed up forever” (Isaiah 25:8). He will heal our broken hearts by resurrecting our precious loved ones to life again (John 6:40). Until then, I hope the memories of your Dad and these promises from God comfort you in the days to come. Jean my dear friend we are thinking of you and praying for you. We miss you so much and feel a great loss loosing Charlie, you and Charlie mean the world to us and we will always be here for you. We love you. Jean, Christina, Phil and families. We were so sorry to hear of your loss. May God give you grace during this time and may your cherished memories be a comfort.